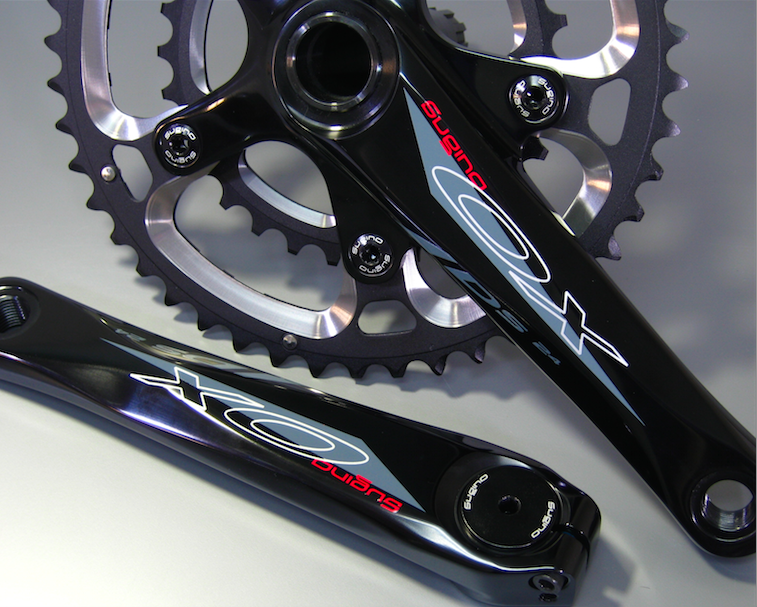 ETA for the 170mm Mega Exo type Omega 46/30t cranks has been set at 4/24/2017. Which means they will be available for sale about 4-5 business days after. Use the below part # to place an order for a set around that time via most bike shops. You will what to find out what bottom bracket standard Motobecane used. The below Omegas fit and come with an BSA (English) threaded bottom bracket. 330-0158BJ3261	Omega Adventure ME 46x30 N10/11 170mm SB black V17 w/o BB,CK-4002ST/WT $ 156.99 retail. Rereading this thread as I'm considering the Sugino OX901D crank and just wanted to acknowledge this beautiful bike and thank the owner for his informative posts. @Mark Manner, how does Sugino deal with chainline? Spacers? What bottom bracket are you using? My frame is PF30 and I'm using an Enduro TorqTite PF30 to Shimano 24mm bottom bracket with Ultegra compact road cranks. If I need lower gears the the Sugino would be my choice and I'm hoping that it would drop in without having to change out an expensive bottom bracket. Last edited by TimothyH; 03-20-17 at 07:10 AM. Hi Tim, sorry I missed this a couple days ago. I am using a regular shimano road bottom bracket (Ultegra BB R60). It is supposed to fit fine with that bracket, and it does work well. However, it is a bit tighter going in than normal, and requires a tap or two from a rubber mallet or a leather shoe heel to get it in. It should work with yours since I was using before an Ultegra compact crankset with the same bottom bracket. The chainline seems pretty similar to my Ultegra before it. No spacers with my English bottom bracket needed. I don't know about the PF30-PF30 to Shimano system so can't say if that would affect it in any way. Wouldn't seem to if you were using a normal Ultegra compact crankset with it. The only odd thing I have noticed about the Sugino 46/30 is that on a friend's bike that I installed one on last week, he had somewhat odd fin-shaped chainstays, and the rear bottom of the front derailleur cage was pretty close to the chainstay after we dropped it down to fit the 46 tooth chainring. I doubt that would be an issue but thought I would mention it in case you had odd really tall chainstays. Let me know if you have other questions, I have 3 bikes now with those cranks. The bike I'm building comes with 46/36 on some of the factory builds so chainstay to derailleur cage clearance shouldn't be an issue but thanks for bringing it up. I'm tempted to just go with the Sugino OX901D and be done with it. It is soooo pretty. I agree, they really are pretty. One thing a bit different about them is that you really do need to retighten the compression plug after you tighten the crank bolts. On my shimano cranks, the compression plug is pretty much just used to tension the cranks before tightening the bolts, and I have never had the crank arm loosen or move outboard after torqueing the crankarm bolts to spec, whether I tightened the compression plug afterwards or not. However, on the Sugino, I found that if you don't tighten the compression plug snugly after you tighten the crank bolts, the crank arm can move out. I had it happen today while riding and re-read the Sugino instructions and tightened the compression plug afterwards as they recommended. The Enduro TorqTite bottom bracket has angular contact bearings and the compression plug is used to set bearing preload. According to Enduro the stainless version gets only 3Nm. That's not much. I'm thinking that tightening the compression plug again to keep the crank arms on tightly might cause too much bearing preload. I'd hate to decommission an expensive part like the TorqTite. Do you think the Sugino crank arm pinch bolts don't hold the NDS crank arm securely enough or is this by design? My guess is the latter since it is in the instructions. What is the plug made of? Is there a torque spec on the plug? Hi Tim, The plug is metal, and is supposed to be tightened very tight initially to make sure the crank arms are in contact with the bottom bracket face. Like on the Shimano system, I tighten the plugs by hand until the crank binds a bit, then release the tension on the plug until the cranks rotate freely and then tighten to torque spec the crank bolts. This releasing before tightening the crank arm bolts releases any undue bearing load and the cranks spin easily. This way of doing it has always resulted in a solid system on the Shimano cranks no matter whether I retightened the plug or not. I think the same approach is correct on the Sugino system, except that you do need to re-tighten the plug after you tighten the crank bolts. I think it will be ok after doing that, but it wasn't really necessary for the Shimano. There is a torque spec on the Sugino plug in the instructions, it is pretty high to initially tension the arms. I don't have the sheet with me right now so can't tell you the exact number. I think it is high because as I have experienced, the crankshaft is a snug fit into the bottom bracket and the tensioning by the plug really is needed to make sure the chainring side is flush. The crank arm bolts are 14-16 nm I believe, similar to the Shimano. I don't think there is any inherent problem with the system, so don't take my comments to mean I feel it is subpar. Interestingly, even thought the non-drive side crank arm had move away from the bottom bracket a bit, the chainring side hadn't flopped around at all. I was doing some intervals and didn't feel a thing but just happened to look down and see a small gap on the non-drive side. Last edited by Mark Manner; 03-23-17 at 06:43 AM. I've now got my 46/30 FSA crank on order at my LBS (supposedly available in mid-May). I already have a BB360EVO BB and the bike was designed for this type of crank, so I don't expect any fitment problems. One thing to keep in mind when going to smaller chainrings is that your front derailleur has to be moved lower down to achieve the specified 1mm clearance to the big ring. With a clamp-on, no problem, but I guess it could be an issue for a bike with a "braze-on" type mounting point. Again, since my bike was designed for it, the frame mount is installed with that adjustment range in mind. Otherwise, seems like it might present a problem with a carbon-frame bike! Has anyone here switched over to a 46/30T crank? I have a conventional BB shell, so I can't use BB30, and my Di2 system limits me to a double chain ring and a difference of 16T. My absolute ideal would be a drop-in replacement for my hollotech Shimano Ultegra 6800 crank. On most climbs, the 34T front with the 32T rear is fine. The most recent bike I built up is my gravel bike, and I wanted to stay with Ultegra but also go with a lower gear than what a 50/34 - 11/32 could give me. As with you, 34/32 is adequate for most climbs, but I wanted something lower for the big ring; figuring that I wouldn't be going all that fast on gravel roads. What I did was to order a 6800 cyclocross crankset. Those are 46/36. However, I wasn't willing go give up the 34, so what I did was purchase a 34 ring separately and bodge the two together so that I now have a 46/34 on the front and the 11/32 on the rear. So, if one is willing to accept 46/34 - 11/32 and stay 6800, this combination might work for you. I wound up using a 46/30T from White Industries (see above post). I do understand that the 46/34T gets you tighter spacing, but making this change doesn't get you a lower low-gear. Great. Let us know how you like it. I may get this for my wife's bike. I got bit by that problem with my 1987 Bianchi. For awhile, I had that IRD 46/30T crank pictured in the first post mounted, and I had to shim the derailleur to get it to work (an ugly fix, to put it mildly). Ultimately, I opted for the most elegant solution: A 52-42-30 triple with the corresponding front derailleur (Athena 11-speed). Didn';t you run Di2 with it? I built up my unpavement rig with one with Di2 and no shimming was needed. Your Bianchi used a collar-clamp FD right? Or was it braze-on? Didn't you run Di2 with it? My Di2 bike is a modern steel frame, and it has a clamp-on for the front derailleur, so putting the 46/30T on that (I used a White Industries crank) did not create any issues at all. Shifting is certainly smoother than with my nearly 3 year old Ultegra crank. @Mark MannerMark Manner out of curiosity what is the proper spacer setup for the Sugino 601D on a 10 speed set up? When I purchased mine the chainrings shipped loose with a bag of various Sugino chainring bolts and spacers and the instructions I got with it made no mention of the spacers..
Last edited by edthesped; 04-29-17 at 08:17 PM. Hi, I am not sure, I got a couple of the OX901Ds with 46/30 chainrings for an 11 speed setup, and they came assembled, no spare parts. For what it is worth, the chainline when I installed it seemed pretty close to the Ultegra 50/34 it replaced, so maybe you can find one and measure to compare. Sorry I can't be of more help. No problem, I think I'm good but am not 100% I really like the cranks but Sugino's instructions are weak. Hi, I have the Praxis in 48/32, and they are nice. However, if you wanted to use Di2 internal wire routing, the Praxis axle is too large a diameter to permit the internal wire routing through the bottom bracket. I have the Praxis on a bike with etap, and got the Sugino 46/30 for a di2 bike. Anything different with Q factor of the Praxis...as compared to Shimano, for instance? I'm thinking of the same crank for a Ti build as well (and eTap). Q-Factor seems same to Shimano to me. I haven't measured it but I certainly don't feel anything different when riding this vs. a SRAM REd vs. a Sugino vs. a Shimano Ultegra vs. a Campy Record. One thing that seems to be noticeable about this crankset as compared to others I have ridden is that it feels really stiff. I think I notice it in particular on the bike I have it on, because it was a bit flexy in the BB area, and this seems to have made it feel more rigid. Maybe I am imagining it. The bike it is on is an old Ghisallo Ti. Great light frame but some flex in bb area. Thanks for that! Very useful info. Last edited by mjrLV; 05-04-17 at 01:17 AM. FSA Omega MegaExo (48/32T and 46/30T and more standard options, BB30 and 'MegaExo' versions). I'm curious where you found any reference to the 48/32T and 46/30T variants; from the link you provided they only showed 50/34 in (3) different crank arm lengths. I know they do make other variants, because my wife just picked up a Cannondale 'cross bike that came stock with an FSA Omega MegaExo in 46/34T. She would love to swap that out for a 48/32T or a 46/30T...if only we could find one! The link is no longer resolving to what I had seen, but it is on there somewhere (unless they took it off). Their website doesn't make things easy. Last edited by wgscott; 05-04-17 at 10:24 AM. After looking at the gear ratios again....I'm having second thoughts on the Praxis, as the difference (improvements) over my current 50/34 do seem minimal. Considering the 40/60 White Industries now. @wgscott have you noticed anything different with the Q factor of the WI, over your previous Ultegra? I had the same question for Matt regarding his Praxis. I'm asking because my feet overpronate outwards, and I've had to get longer spindles for my Speedplays for instance, so it's always something I consider. Yeah, it buys you about 1/2 a gear increment. I kind of wanted to get the Praxis since they are based in the same zip code I am, but I didn't think a 32 was significant. I can get a bigger gain by changing tires. The Q-factor is larger, but it hasn't been a significant issue for me. However, I also over-pronate. (I got a lecture on it from my ankle surgeon, as if I was making some sort of morally delinquent lifestyle choice). My right foot also points outward about 10 degrees, and as a consequence, I get a right heal strike occasionally at the center of the crank. This did not happen with the Shimano Ultegra crank (or my Campy Athena triple for that matter), or if it did, I never felt it because the profile of the Shimano Ultegra crank-arm is so smoothly rounded/tapered off. In retrospect, it would have been cheaper to keep my Ultegra crank and throw my Di2 Ultegra derailleurs in the trash can, purchase and install XT Di2 derailleurs, and whatever honking huge cassette I could find to go with that. The Q-factor is larger, but it hasn't been a significant issue for me. However, I also over-pronate. (I got a lecture on it from my ankle surgeon, as if I was making some sort of morally delinquent lifestyle choice). My right foot also point out about 10 degrees, and as a consequence, I get a right heal strike occasionally at the center of the crank. This did not happen with the Shimano Ultegra crank (or my Campy Athena triple for that matter), or if it did, I never felt it because the profile of the Shimano Ultegra crank-arm is so smoothly rounded/tapered off. I heard someone, I think on RBR, mention that the Praxis spindle/BB doesn't get along with Di2 cabling FWIW. Depends on your BB shell. It, and the 30mm White Industries one, don't leave enough space in my BB shell, which is the conventional English threaded version (BSA). That's why I had to go for the square taper.